Want to Take a Class? Getting started is easy! Visit our store or contact us to sign up. 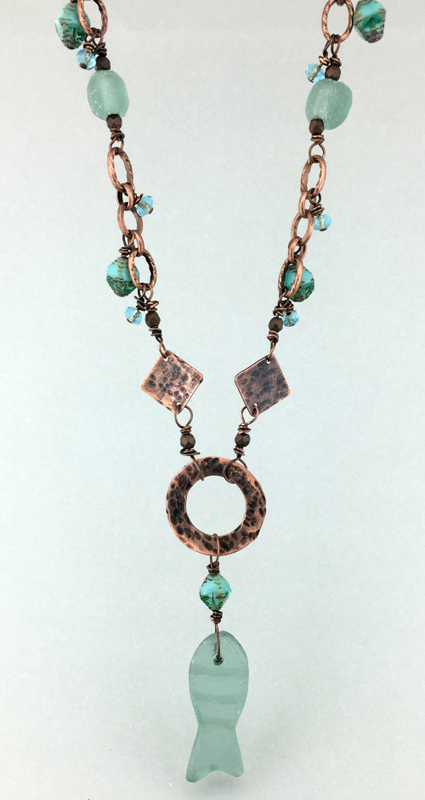 Learn to combine, beads, chain, wire and metal in this fun one of a kind necklace. 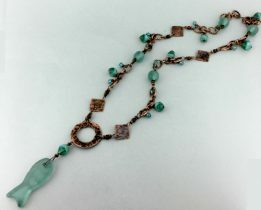 Skills taught will include an easy technique to texture metal, how to connect chain to wire, how to make a wire clasp, plus hone your wire wrapping skills. You will also receive a copy of the instructions with the class fee. We keep our classes to about 8 customers so you get plenty of time to ask questions and get personal attention. The instructor fees range from $15 to $40. We provide the tools and bead boards. You will learn the proper tools to use and how to do the project. All materials you pick out for the class must be purchased that day! Instructor fees are to be paid straight to the instructor with cash or check. You may call and hold your spot with a credit card and pay the instructor the day of the class.